The music for movement in my studio is as varied as my mood. As many choreographers and dancers will tell you, virtually any piece of music can be used to express through dance, think of Balanchine's genius as a perfect example. Whether Adagio or Allegro, the choices of my music are on a wide spectrum. Think about the great fun you can have with turns and leaps to Michael Jackson's 'Invincible'. I also adore Christina Aguilera and it evokes very strong emotions in me. I used one of her songs for a simple dance video of me doing careful pointe after three months rehabilitation recovering from a hip flexor injury, but due to possible copyright problems I cannot share the original here. How do YOU like to move to music? Bottom line: dance for yourself, whenever and wherever your heart takes you. When or Why Do You Cry? I cry when it means something to me that evokes a STRONG emotion. Like dance, crying is a release, a stress reliever. Ultimately for me, it's probably a means of expression when emotion consumes me as a sadness where my heart aches, or I'm so happy that my heart sings. 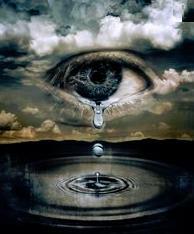 My husband and male friends feel perplexed when I suddenly cry and within mere moments I simply stop. I describe it as a teapot that's reached a boiling point and spews to release the pressure and within a short time I'm balanced again. Crying is a venting mechanism for stress that helps me keep a balance between my inner child and my adult self. Of course, crying can be for other reasons and I'm not making generalizations for all, just sharing my most common reasons. The point? We all need to find ways to de-stress so there's a balance of our adult self and inner child.